From making my Matcha no. 8 I’ve still half a recipe of the tofu cream. With said cake I realized that the tofu cream’s lemon was slightly prevalent, perhaps a little too assertive for my liking it paired with musky matcha. That being said, I did thoroughly enjoy the tofu cream; it being lusciously smooth, creamy, light, and surprisingly, without the raw earthiness of tofu. So, while juggling several potential flavours for my follow-up cake (to use up the leftover tofu cream), I decided not to try and balance nor counter the “lemonness”. Instead, I chose to embrace the flaw and accentuate the bright citrus flavour. This cake, with a staggering stance of, again, eight layers, is constructed with a moist, maple-soaked lemon sponge, tart lemon curd, and of course my recent chou-chou tofu cream. The sponge, aside from the evident sporting of lemon, also features maple syrup, which provides all of its sweetness without the use of refined sugars. The maple syrup also adds moisture to the cake, keeping it incredibly soft and tender even in the absence of eggs, milk, and butter. Another ingredients I added was baking soda, which not only aerates the crumb, but also helps it stay tender longer after it cools. If I were to choose a single word to describe this cake: ambrosial, meaning 1. exceptionally pleasing to taste or smell; especially delicious or fragrant. 2. Divine. To make the lemon sponge, preheat the oven to 392 degrees F, with the rack placed in the middle of the oven. Line a half sheet pan with parchment paper. In a large bowl, whisk together the flours, baking powder, baking soda, and salt. In another bowl, beat together the oil, soy milk, maple syrup, lemon zest, juice, and vanilla until emulsified. Pour the soy milk mixture into the flour mixture and stir briskly just to combine. Using an offset spatula, spread the batter smoothly into the prepared sheet pan and bake for 10 minutes, then cool completely. This may be kept for up to two days, refrigerated, in an airtight container before the actual assembly of the cake. To make the maple soak, stir together the 1 tbsp maple syrup with 1 1/2 tsp warm water. Cut out six squares of the lemon sponge using a square mousse mold (11x11cm). Put the mold onto a cake stand and place in it a piece of the sponge, right side up. Brush the top with the maple soak. 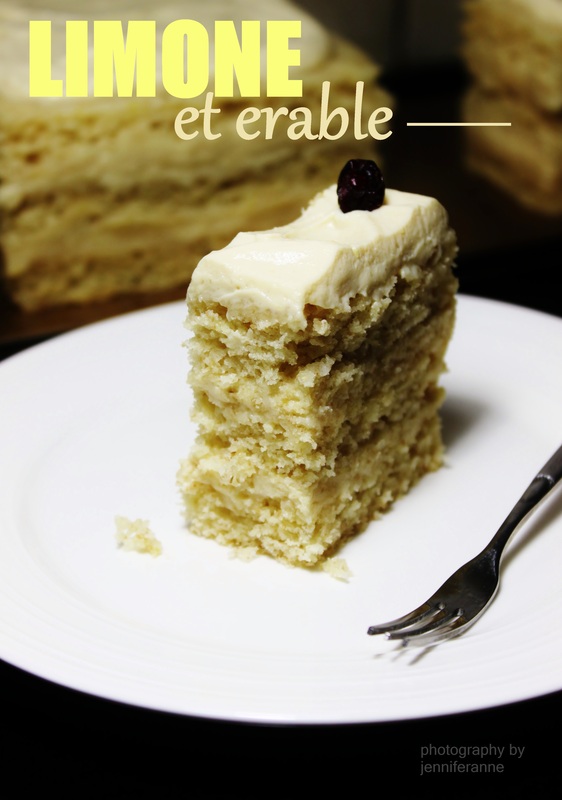 Spread a thin layer of lemon curd over the cake, then cover with a thin layer of the tofu cream. Repeat all procedures with the second cake layer. Top with a third cake layer, then finish with the tofu cream. Do this with the other three squares of lemon sponge. The recipe will make two completed cakes, or 16 servings. Garnish each serving with a dried cranberry, if desired, and serve it chilled.